Grow my own Salad – now that’s a challenge! I watched a gardening program on TV a couple of months ago suggesting you should grow your own salad. Not only was it more cost effective but it was always readily available. I have tried in the past to grow vegetables, but with varying degrees of success. 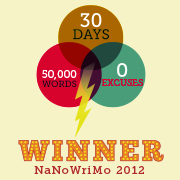 However, I am the eternal optimist so I will try again. What a good idea PMA (Positive mental attitude) – this section of my blog will be a record of my successes and hopefully not too many failures…so if you have any useful tips please share! My goal is to grow lettuce, tomatoes, radish, courgettes, cucumber, spring onions, French beans and beetroot! I doubt they will all be ready to eat at the same time but it’s worth trying. The lettuce is growing in a large container; but rather than grow and pick the whole lettuce, the plan is to just cut the leaves as required. 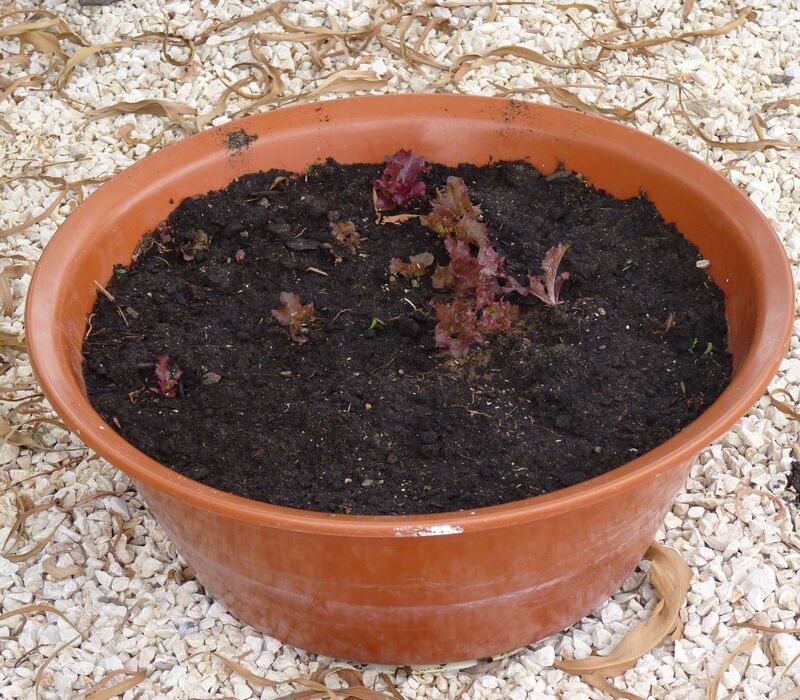 I planted 3 different varieties of lettuce 2 weeks ago (about the 17th May) and the first to appear, as you can see in the picture, is the Lollo Rosso. This is the lettuce with the reddish leaves. While I am optimistic the other seeds will eventually germinate, I have planted some more today, just in case; Alface Romana – which looks like the English equivalent of a cos lettuce (hopefully) and Maravilha – the English name escapes me at the moment. Not long to wait for my Cherry tomatoes! Tomatoes – the first batch of cherry tomatoes seeds were planted mid April. These are now maturing in pots and the first flowers have set – Yippee – I love cherry tomatoes but they are so expensive to buy in Portugal. However, I think I will be eating the tomatoes long before the lettuce! 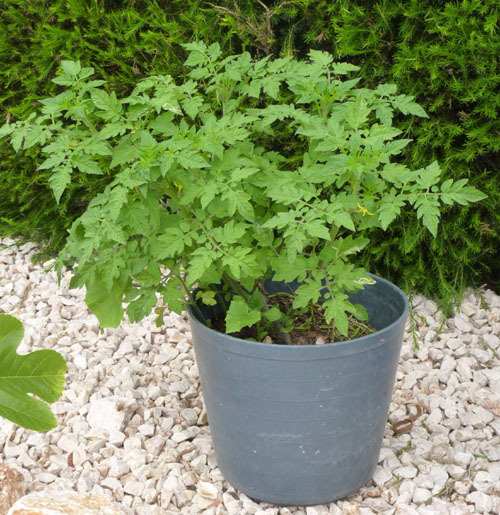 The plum tomato plants are now ready to pot on. I plan to sundry some of these for when I make sun dried tomato relish later in the year. Radish, spring onions, beetroot and French beans – planted the seeds today. Cucumber – plants just a couple of inches tall. The baby courgettes, turn yellow, wither then die! 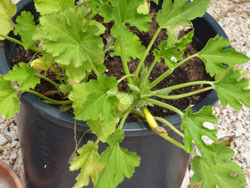 Courgettes – I am growing these in pots so they are easier to water. They were doing well, but some of the baby courgettes are now turning yellow then rotting. The tomatoes seem to be doing well, I also love sun-dried tomatoes. Could it be over-watering with the courgettes?